My daughter, Shloka, carried Sparky inside the house with Kartik, my son, yelling Me, Me. I just stood in one corner and watched the unparalleled joy on my children’s faces. Shloka was in class 10 and Kartik in class 7 but they looked like babies admiring their most precious toy. How could I take this joy away from my children? Couldn’t I learn to live with my fear and be the mother they would love to look up to? At that moment nothing else mattered more than keeping that look of happiness and wonder on my kids’ faces, my mind was made up but they didn’t know it yet. Just then Sparky looked up at me and her eyes seemed to bore into my soul, as if questioning my reluctance in accepting her into my heart and home. Shloka and Kartik picked Sparky up after the allotted 2 hours and trudged out to leave her back with her mother, Spooky. I followed them there and when my friend opened the door and saw me, she knew I had changed my mind. She picked up Sparky and put her in Shloka’s arms and told her she was hers forever, a gift. My children understood something crucial that day too, they were convinced I loved them more than life itself and would go to any lengths to shield them from life’s blows and safeguard their happy smiles. By welcoming Sparky into our house, I added another loving member to my family…contd. Finally you let sparky in 🙂 Yay! You were brave to make that decision but it was worth it, right? 🙂 Yes. Sometimes, that happiness matters more than anything else. Sparky stole my heart and has it still 🙂 She is my darling baby. Aww…so sweet! I’m so glad you kept her and overcame your fear. Pets have a way of choosing you rather than you choosing them. I think that’s what her look was about. I repent not having read your posts from April 1. But I made up by reading all your posts now. 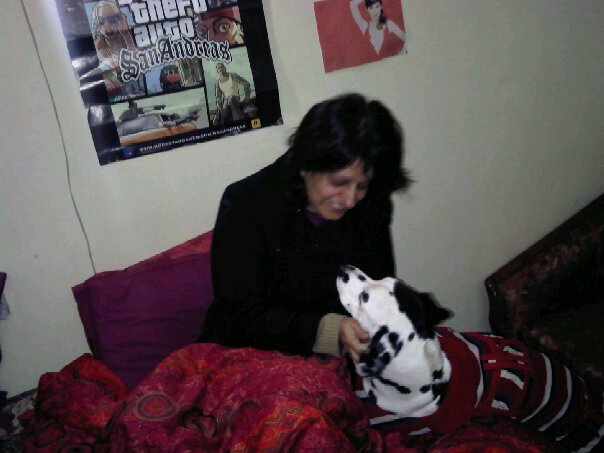 I just couldn’t help notice the coincidences with Sparky and Cookie (the dalmatian of my home). She is 2 years old now but entered our lives as a puppy in Dec 2012 just before Christmas and has been a darling ever since. My mom (just like you) was apprehensive of dogs and now she is the first one to stroke or play with Cookie. 🙂 Looking forward to your posts on Sparky and wishing her a speedy recovery. Thanks a ton for making the effort to read all my posts. I love the name, Cookie, share her pic with me please 🙂 Sparky is a sweetheart with a will to survive and be with us, because she knows I won’t be able to handle her going away. I think Sparky loved you in that moment. But the line that caught my attention was – I realized that sometimes the happiness of those we love is more important than self-preservation – how perfectly put. How sweet!! Sparky is in!! 🙂 yay! at last! moms are moms, yeah? Prasanna, I love Hachiko’s story, cried so much while watching the movie.I fell in love with my Sparky when I picked her up for the first time and she licked my hand. Happiness is the biggest reward, esp when it’s your family’s. Shilpa, I was a goner when Sparky looked into my soul 🙂 Thank you for your lovely words. awww now that’s a scene that could melt anyone 🙂 No wonder Sparky became a part of your life. How sweet! I’m glad you did the right thing for your kids and for you by letting their happiness take over your fear! 🙂 Yay, you! Lucky…….now I know why you were so afraid of Spooky (in Fernsons)……LOL!!!! !Loving the story on our Sparky.